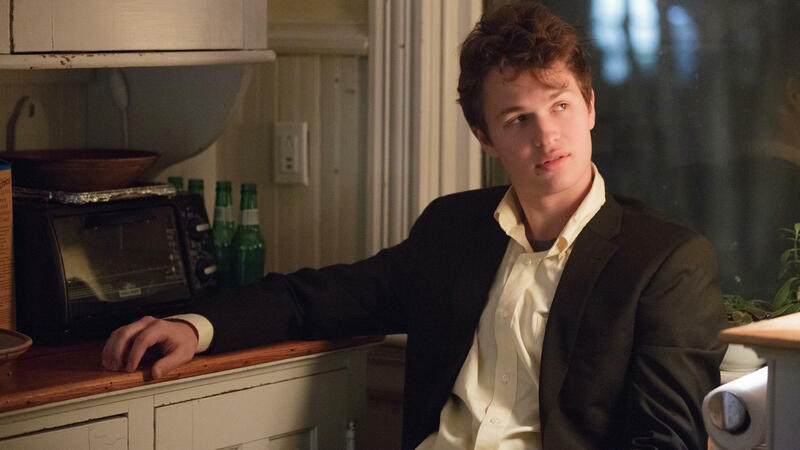 In A Blazer of Glory: Preppy Addison (Ansel Elgort) preps to investigate a murder in November Criminals. A murder mystery narrated by a toxically self-aware teenager, Sam Munson's 2010 novel The November Criminals is the kind of book that attracts smart filmmakers and serious actors — that then, all too often, gets diluted into a bland disappointment like November Criminals. The movie was co-written by Steven Knight (Locke) and Sacha Gervasi (Hitchcock) and directed by the latter. It stars Ansel Elgort (Baby Driver) and Chloe Grace Moretz, supported by David Strathairn and Catherine Keener. Whatever drew them to this endeavor is not in the finished product. There's no quick way of determining if it was lost in the writing process or left in the editing room. Phoebe is learning Mandarin and has already been accepted to Yale. Addison is counting on the University of Chicago, where the Virgil-loving kid intends to study classics. So far, not exactly Mean Streets. Nor is the murder, in which Kevin (Jared Kemp), a black classmate, is shot while working as a barista in a cozy, non-chain coffeeshop in Addison's part of town. Kevin used to swap literary paperbacks with Addison, who undertakes to investigate the killing when the police shrug it off as gang-related and probably unsolvable. The movie ties Addison's refusal to accept Kevin's fate to his difficulty in accepting his mother's recent death. Both are enigmas too overpowering to be ignored — and far too complicated for this sketch of a movie. Addison begins his digging at school, over the objections of the principal. He soon moves to more dangerous turf, sometimes with Phoebe's help. Both kids are careful to say as little as possible about their extracurricular activity to their single parents, Addison's empathetic dad (Strathairn) and Phoebe's uptight mom (Keener). Things get a little scary, and then it's all over. No feature-length film can incorporate all of a novel's content, but it's likely that the first cut of November Criminals had significantly more plot and characterization. At 86 minutes, the movie is so compressed that it doesn't even take time to explain its title. Among the quirks that make the book's Addison more prickly than the movie's is the Jewish teen's taste for Nazi- and Holocaust-related humor. "The November Criminals" was the Nazi term for the German officials who signed the armistice that ended World War I. A different sort of missing ingredient is the purported setting. Filmed in Rhode Island, November Criminals never looks or feels like D.C. That's important, and not just visually, because the story turns on such local color as the city's complicated racial dynamic. The movie does eventually account for one of its references: Addison, who seems to live in the 2010s, is devoted to the music David Bowie made in the 1970s. That's explained in a shot toward the end of the credits. But by then most viewers will have already declared this case closed.